An enclosed gear box for protection from the elements, an adjustable shoulder strap and a convenient application chart (located on the bottom of the spreader) make this spreader easy to use. Calibrated flow rate adjuster and easy on/off control. 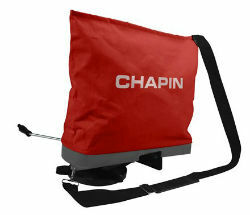 25-Pound capacity heavy-duty, waterproof, zipper-top bag. Compatible with a variety of seeds and granular fertilizers.